It has been believed for many years that a certain New England lighthouse had been demolished after it was automated in the early 1900’s. 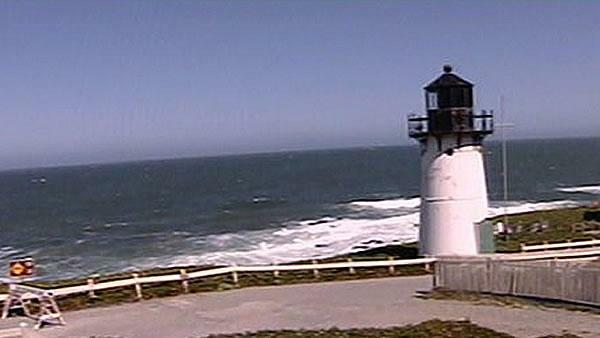 It has now been found, still standing, all the way in California where it was moved by the government to replace another lighthouse that was being torn down. The identity of these two lights is to be published in the June 2008 LD. I do not know which lights these are. I am going to guess that the source is Long Island Head Light at Boston and the recipient is Point Montara Light at Montara, CA..
Dave, is that you "Boats"..
From The Cape Cod Times . . .
on the southern end of San Francisco Bay. It was a genuine shock, said Wellfleet historian Helen Purcell. Good chance this lighthouse came by ship, the Navy did alot work for the Coast Guard in the 1900s, if it came by rail you need to check the local news papers from that time, there might be some info there, nav-aid reports from that time maybe, town building records, check to see what Coast Guard ships were ordered to the west coast at that time. This may have been done already, then again?.. "Boats".. Boats. The CG would likely not have had involvement with this project. It was the U.S. Lighthouse Service at this time. The cast iron towers were constructed from sections that were bolted togther to form a circular tier on which additional tiers were bolted. The sections fit together easily and were easy to dismantle and move. The individual sections could be stacked on a rail car for transport. This is the same type of construction used for cast iron and steel storage tanks. Likewise, the lantern sections could also be easily be unbolted. This is why I guessed Point Montara because it appears to be the only cast iron "pre-fab" tower on the California coast. What surprises me is the 1939 date that was given for the date of removal of the Mayo Beach tower when it was removed in 1922-23. During that 16-year period it would seem someone might have noticed the tower was missing. Maybe a Temp was put there in place of the iron light and that one was taken down in 1939. And there is another light that looks like this one on the coast, just can't recall the name and I saw it some years ago. "Boats"..
Must be my age. "bbooaattss""". Not much said there, in fact what was the point. we know the lighthouse has been on two coasts, now what is the rest of the history . There is a record somewhere, but where?.. Set the Watch Mate, find this record. Come on folks, we can send stuff out and land on Mars, what so hard about finding the history of this little lighthouse ?? "Boats".. In my book, "The Lighthouses of Massachusetts," I made the mistake of repeating the 1939 date for removal of the tower. That date has been repeated in many places; I have no idea of how it originated. My immediate thought is that the lighthouse was most likely shipped in pieces on a barge, passing through the Panama Canal. There isn't necessarily any surviving record, so we might never know for sure.